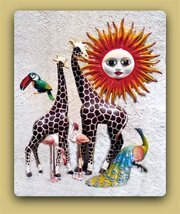 The online store, a comprehensive guide about our nation's folk art and a San Jose del Cabo insightful guide. Below you will find brief explanations about these sections and links to see them. Please browse our Top Nav Bar where you can access any page in our site or click on the pictures on the right side menu to see highlighted pages. 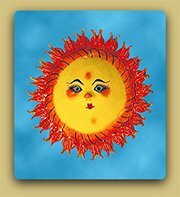 For over 20 years, we've proudly promoted and sold the best of Mexican folk art; first at our brick and mortar store located in San Jose del Cabo, Mexico and now at this website. We've had the opportunity to journey across The Deep Mexico encountering authentic folk artists that introduced us in their artwork and its creation process sharing with us the history and the stories behind their craft and honoring us with their friendship. At Copal Online Store, we guarantee our customers' complete satisfaction featuring high-end authentic items at reasonable prices in a relaxed and pleasant online shopping atmosphere. There are few countries in the world with such deep and diverse culture as Mexico. Our nation's folk art is a perfect example of this cultural abundance. 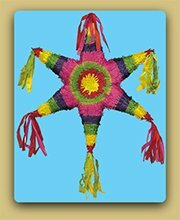 The Mexican Folk Art Guide section of our site was created to share with our visitors the information we have been blessed and fortunate to learn firsthand over the years. Mexican folk art styles are described including history, cultural background, making process and celebrated artists. 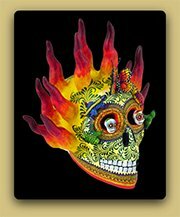 Special themes, like Day of the Dead, portray the culture and traditions that are behind the artistic expressions that are called Mexican Folk Art. We know there is no end to this job, and that's one of the reasons we love it dearly. 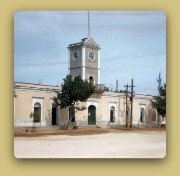 For 25, years, San Jose del Cabo in Baja Sur Mexico has been the place we call home, our family grew bigger in here, adding grandchildren to the bunch. 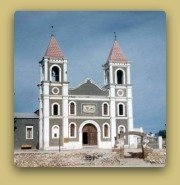 We first visited before all the tourist boom began; we are fortunate to have known the small villages before they became the world-class tourist destination called Los Cabos. 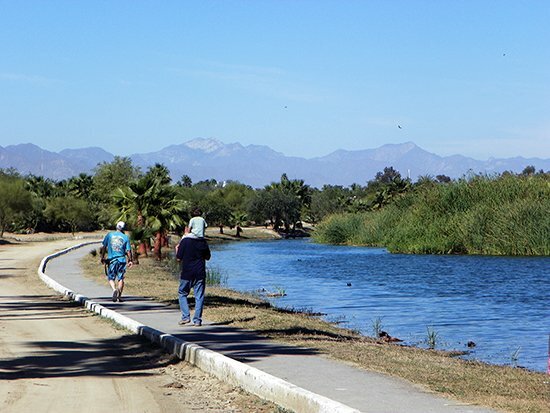 We settled in San Jose because its charm and natural beauty captivated us at first sight. 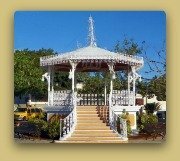 San Jose del Cabo is part of our family and business background and by adding this section to our site we want to lead our valued visitors through a path that will help them understand and appreciate in a more insightful way our beloved town. 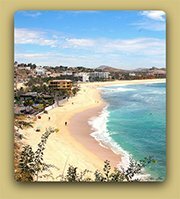 San Jose del Cabo Insights features engaging, relevant and accurate information about San Jose, its history, amenities and natural beauties. There are 4 ways to let us visit you! 3) Copal Store is on Twitter too. Reach us there with any questions or comments you may have or just get our updates and special content. Click here and then click the Follow button over there. 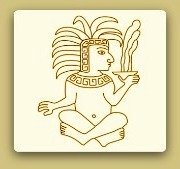 4) Go to Copal Facebook page and click the Like button. 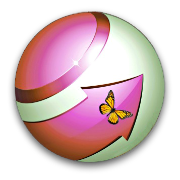 Then you will receive every update of our site and would be able to contact us with any questions or comments you may have. 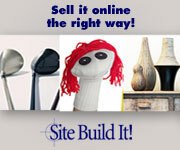 We sure hope you enjoy visiting this site as much as we do making it. 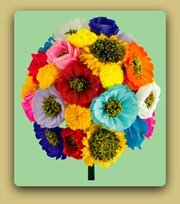 The assorted paper flowers bunch can be made mixing artisanal sunflowers, dahlias and roses handcrafted in crepe paper by Eduardo Dieguez Flores from La Paz, Baja California Sur. 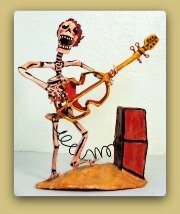 The Adelita and son skeletons sculpture is a handmade and hand painted sculpture by Mario Moreno with a wire structure covered with papier mache. The Emiliano Zapata skeleton sculpture is a handmade and hand painted sculpture by Mario Moreno with a wire structure covered with papier mache. 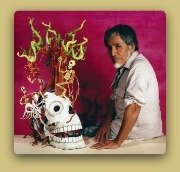 The Tree of Knowledge Skull is a wired structured and papier mache, also known as alambroide, handmade and hand painted by Mario Moreno. In this drawing Cristino Flores Medina represents the Deer Hunting Story. 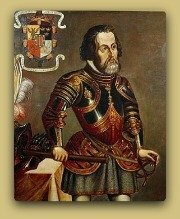 In this drawing Cristino Flores Medina represents the Delgadina Story. In this drawing Cristino Flores Medina represents the Good and Evil Story. In this drawing Cristino Flores Medina represents the Jaripeo Story. In this drawing Cristino Flores Medina represents the Jesus Ascencion Story. In this drawing Cristino represents The Last Supper Story. In this drawing Cristino Flores Medina represents the Mezcala Livestock Story. In this drawing Cristino Flores Medina represents the Nativity Scene Story. In this drawing Cristino Flores Medina represents an Old Lady Story. In this drawing Cristino Flores Medina represents the Snake Fright Story. In this drawing Cristino Flores Medina represents the Emiliano Zapata Story. 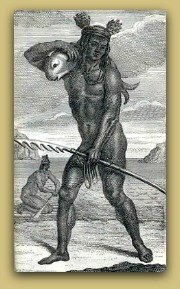 In this drawing Cristino Flores Medina represents the Samson Story. The Sermel cow was handmade and hand painted in Tonala, Jalisco by Sermel papier mache. Cute, peaceful and as beautiful as a real cow. Sermel Dolls are made of papier mache. Colorful and beautifully decorated with birds and flowers they were handmade and hand painted in Tonala, Jalisco. The triangular skirt dolls are among the most popular pieces made by Sermel workshop. The Sermel duck is beautiful and straightforward just as a real duck; when you look at him you are waiting for him to quack. 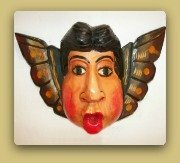 Handmade and hand painted in Tonala, Jalisco by Sermel Papier Mache. One of the most traditional and best know items from the workshop, the Sermel eggs came with their hand forged iron stands. The Sermel eggs were made of papier mache, hand molded and hand painted, featuring scenes of deer, birds and rabbit on the woods. Sermel elephants belong to a series of animal figures that are more natural and in which the workshop demonstrates its domain of the papier mache and painting techniques. These Sermel representations are fierce and magnificent as the real pachyderms. Sermel frogs are green, with big eyes and about to jump, just as any one would expect them to be. Handmade and hand painted by Sermel workshop. They are scary, big and aggressive yet captivating and attractive. The Sermel Hippo and Rhino set seems just natural. A more realistic approach by Sermel the animals in this set are wonderfully sculpted and painted. Sermel leopards are wonderfully sculpted and carefully painted just as any other piece made by the workshop. Sermel successfully captures the soul of this playful, curios and yet dangerous felines. Original and whimsical the papier mache Sermel mushrooms feature traditional Tonala's painting style with deer, birds and rabbits on the woods. 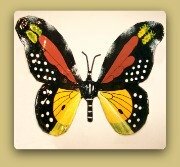 They are handmade and hand painted like every piece made by Sermel. These birds symbolize wisdom in many cultures and the papier mache Sermel owls sure look clever. They were handmade and hand painted in Tonala Jalisco. The Sermel peacock is resting on a branch, magnificent and colorful. The beautiful and delicate painting details the beauty of the real bird. Sermel tigers are wonderfully sculpted in different positions and in different sizes. The ferocity and beauty of these felines makes them just as charming as the real ones. 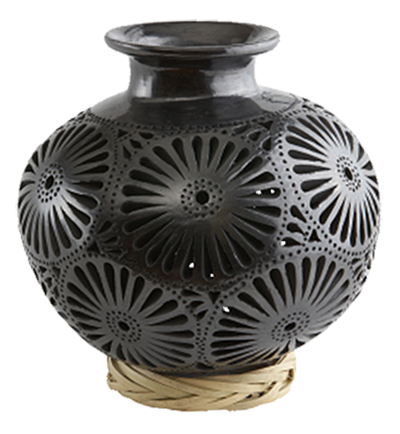 Multicolored clay made in Izucar de Matamoros, Puebla is best known for its tree of life candelabra and incense burners decorated with fine lines that almost look like filigree. Other pieces made in the area with the same decorative style include skulls ornate with flowers and animals, whimsical skeletons performing different actions and assorted candlesticks. Painted Clay from Guerrero. Animals, boxes and plates painted in bold colors by Nahuatl speaking artists from the Rio Balsas Basin with colorful birds, flowers and landscapes. 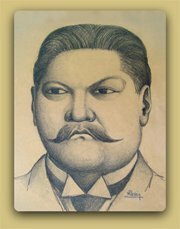 Pantaleon Panduro was born in Tlaquepaque Jalisco on July 26th 1847. Gifted with an amazing talent to sculpt clay; he created human figurines and busts with extreme realism. 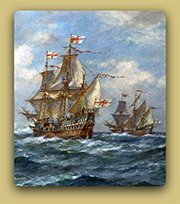 Pantaleon never received any formal instruction but his natural talent granted him with international recognition. Coconut masks known in Spanish as Mascaras de Coco are whimsical and colorful faces, animals, suns and mermaids made of a coconut shell half by Nahuatl artists who live in the Mezcala region along the Balsas River Basin in Guerrero State. 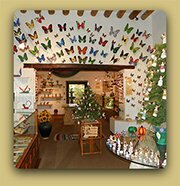 Mexican ironwood carvings are made in the states of Sonora and Baja California from the tree desert ironwood (Olneya Tesota) known in the area as palo fierro. 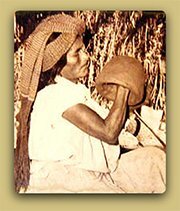 The craft was originally developed by the Seris, an indigenous group of the Sonora State. Oaxacan wood carvings, known in Spanish as monos de madera or alebrijes de Oaxaca have been around for a little more than 60 years. Manuel Jimenez a peasant from San Antonio Arrazola is the creator of this tradition. 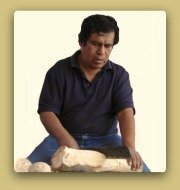 Description: Jesus Sosa Calvo is a wood carver from San Martin Tilcajete, Oaxaca known for his fine carving and delicate painting. His motifs include cats, dogs, angels, skeletons and devils. 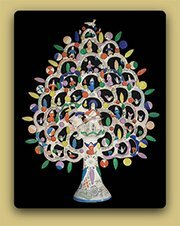 The Amate paper paintings are a folk art style that combines the paper crafting from San Pablito in Puebla and the painting from The Mezcala region on the Rio Balsas Basin in Guerrero. 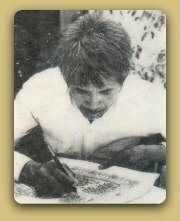 Cristino Flores Medina (1937-2007) Cristino Flores was a pioneer in amate paper painting, he began painting on brown amate colorful scenes and landscapes but soon developed a personal style. : Papel Picado is a string of tissue paper flags chiseled with different patterns and used to decorate buildings, Day of the Dead altars and streets during secular and religious celebrations in Mexico. Paper filigree or quilling is a paper craft that consists in rolling thin strips of paper with the help of a needle point tool to form basic shapes that are glued together creating all different kinds of figurines simulating the metal filigree. Nicolas de Jesus is an internationally acclaimed engraver and painter from Ameyaltepec, a small village located in La Mezcala, a Nahuatl region on the Rio Balsas Basin in the Mexican State of Guerrero. 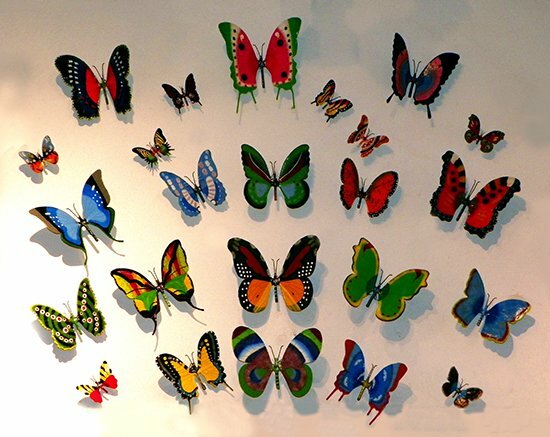 Papier mache butterflies are a unique folk art style created by a Mayan family from Izamal, Yucatan. 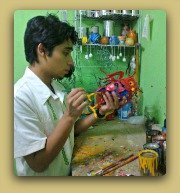 Sermel is a papier mache workshop located in Tonala, Jalisco Mexico. 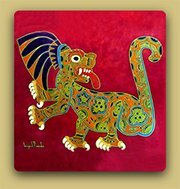 Their style is bright and colorful and their pieces, especially animals, are painted with the traditional designs that have characterized Tonala's crafts. La quema de Judas or The Judas burning in Mexico is a celebration held in Sabado de Gloria, Holy Saturday. Papier mache devils symbolizing Judas Iscariot stuffed with fireworks are exploded in Local Plazas in front of cheerful spectators. 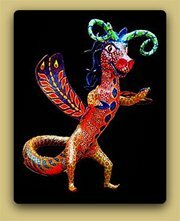 Alebrijes are imaginary creatures that have elements from different animals such as dragon bodies, bat wings, wolf teeth and dog eyes. The authentic Mayan hammocks are hand woven in Yucatan, Mexico using cotton or nylon thread. 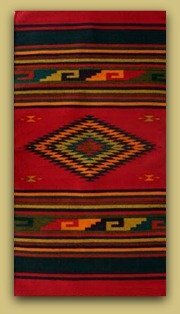 Zapotec rugs are made of wool in Teotitlan del Valle in Oaxaca State. 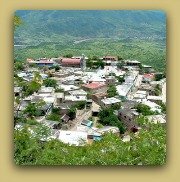 The town has pre-Hispanic weaving tradition and its world famous for his fine tapestries woven with Zapotec patterns. Wool animals are made in San Juan Chamula, Chiapas by Tzotzil women. Colorful and joyful the hand crafted animals that express the soul of their makers have quickly become a favorite among Mexican folk art lovers. Day of the Dead flowers is the name given to flowers used during the Day of the Dead Celebrations. 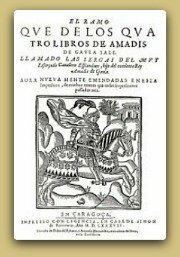 Among these flowers are the Cempasuchil, the Terciopelo, the Gladiolus and the Alhelis. Day of the dead bread is prepared all around Mexico in the last days of October and the first days of November and is used in the altars or ofrendas (offerings) set in Day of the dead. Day of the Dead art are all the folk art items made for this celebration or as a consequence of it. Day of the dead altars known as altares de muertos or ofrendas (offerings) are set during the Day of the Dead celebrations on November 1 and 2 to honor the dead children and adults. 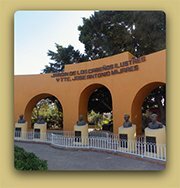 Janitzio is a small island in Patzcuaro Lake in the southern state of Michoacan. The small town is world famous for its traditional Day of the Dead celebration. Sugar skulls candies are used during the Day of the Dead celebrations as funny treats and in some areas as ornaments and sweet offerings on the altars prepared to honor and welcome the souls of the dead. 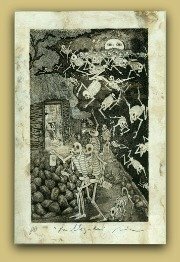 Jose Guadalupe Posada was a lithographer and print maker in Mexico's pre-Revolution times; he is best known for the creation of La Catrina, the skeleton lady that became the image of death in Mexican culture and is considered by scholars the father of Mexican modern art. 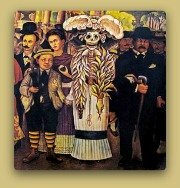 La Catrina was originally created by Jose Guadalupe Posada and later named and painted dressed up by Diego Rivera in one of his murals. 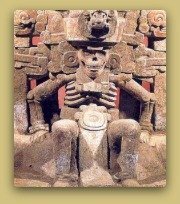 It became an iconic figure in Mexican culture representing death and the way Mexicans face it. The Calaveras or Day of the Dead rhymes are satirical verses published in the Day of the Dead by news papers and magazines. 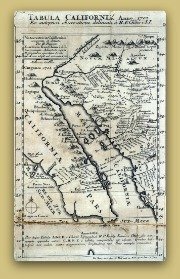 It is widely accepted that the origin of the name California is Garci Rodriguez's chivalric romance, Sergas de Esplandian a story about an island called California and its inhabitants the Calafias, black amazons that lived with no men and made their weapons with gold because there was no other metal on the island. 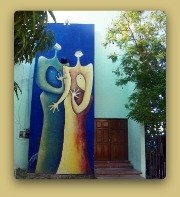 San Jose del Cabo Casa de la Cultura. 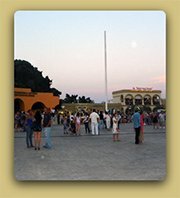 San Jose del Cabo weather forecasts, climate conditions and tips about when to visit. 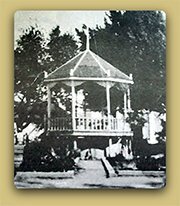 This page tells about Copal Store principles, foundation and history; featuring pictures of the last 21 years of the Agur's family business. 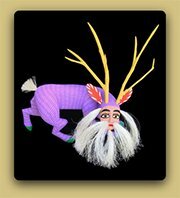 Mexican Folk Art Blog keeps you up-to-date with all additions and changes to this site. 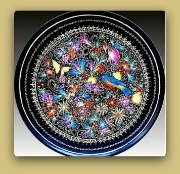 Copal Website Search is the place to look for that given page, particular word or specific folk art style you are looking for but can't find.